Resignation. It all sounds so serious. When analyzing Stephen Harper’s political rise you will not see evidence of a man who gets shook. A practitioner of incremental politics, Harper is the chess master of Prime Ministers, a strategic, successful player who has perfected the craft of staying out of check. Harper’s undeniable professional preference is saying as little as possible while legislating as much as he can. He answers to no one, and omits key details of his biggest ideas, cramming them inside omnibus bills alongside a host of other uncorrelated legislation. He hooks his rivals, studies their weaknesses and wins game after game after game. A majority government has proven to be been the only environment where Harper can govern as a true Reform-conservative. Without it he has to negotiate, compromise or navigate his convictions away from the gradual, rightward pace he has fostered to retain power. After 5 years as the prime minister of a minority government, Harper finally achieved his long sought majority and Canadians saw this pace of incrementalism quicken. A blank cheque was written, and it has been Harper’s sole currency ever since. Enter Senator Mike Duffy, one of three lepers in the current Senate debacle. Along with Senators Pamela Wallin and Patrick Brazeau, all three appointed by the prime minister himself, Duffy is currently fighting for his very livelihood. It’s at that point – when you have nothing left to lose – that you can finally go for broke. Today Duffy went for broke. And while his version of events is that of a victim; a meek ex journalist, politically unripened, feeling extreme pressure behind the scenes of power, Harper has at the very least underestimated the savvy of the newsman turned senator. But Harper, who views journalists as a cabal of adversarial left-wingers, probably thought Duffy was just happy to be elevated to such a distinguished position that he would forfeit his reputation and integrity for the good of the party. Fate lies in the simplest places sometimes. A chain of emails between Harper’s former chief of staff Nigel Wright, Conservative Senator Marjory LeBreton and Duffy could provide the embattled senator with his main pillar of defence to the motions to expel him; that he was told he was not breaking any rules by repaying the now infamous $90, 000. This pillar of defence just so happens to be Harper’s albatross, forcing him to testify under oath whenever Duffy and Co. get their day in court. 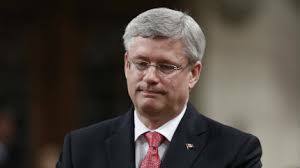 And if even the smallest of accusations against the prime minster are proven to be accurate, such as lying to parliament as to when and what he knew about Wright’s peculiarly issued cheque – Stephen Harper will most likely resign long before the next election. If the conservatives did conduct such a needless and disastrous public relations stunt, a stunt resulting in Harper losing the loyalty of a fellow conservative for the second time this year in public, it will poison the party among voters and the base they rely on so heavily. And if Duffy’s most stinging stanza – ‘Today you have an opportunity to stand strong and use your power to restrain the unaccountable power of the PMO’ – persuades enough conservative senators to vote against Duffy’s expulsion from the Senate, Harper will be left without any clothes for the first time in his long political life. He will be surrounded. He will have to retreat behind his pawns. He began today even before the Duffy address to the senate. During Question Period, the prime minister punted the most poignant questions raised by Opposition Leader Thomas Mulcair to his seldom-used parliamentary secretary, Paul Calandra. Calandra did his best Stephen Harper impersonation and deflected questions, meandering to arbitrary remarks about the recent European free trade deal. In short, Harper tried to hide from Canadians in plain view, losing more credibility every time he stood up in the house. Of course, there is a chance Duffy was telling a very tall tale. But one of two things seem apparent; either Duffy told a thousand lies, or Harper has been telling one for over half a year. As many conservative strategists have said, including Stephen Harper himself, according to Duffy: The only thing that matters is the perception of the public. Nothing else. It’s a good bet the public’s new perception has turned that once blank cheque into checkmate.